We offer to rent cars, vans and specialty trailers, and tow trucks. 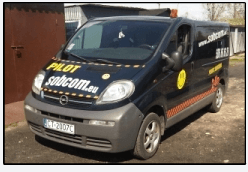 * Van - Closed - Opel VIVARO 1.9 DCI, DMC: 2.7 T, Ladas. 1020kg, towing - trailer DMC 2T. (From 199zł per day)..
* EMERGENCY ROAD, DMC: 12T, order. 5T, hydraulic platform 6 x 2.2 m (299zł per day). * Trailers - LAWETA, DMC: 2T, for the transport of cars, motorcycles, quads, 4x2m platform (since 99zł per day). Deposit required and appropriate law-license. For detailed information please call.